Given Hamas' stated goal of eliminating Israel and imposing a single Islamist state across Palestine, what is the optimal number of long range rockets and other heavy weaponry that Hamas should have? This is a serious question, not a rhetorical talking point. I’m convinced the answer is zero. It strikes me that any other answer accepts, implicitly at least, that it is tolerable for Hamas to have the ability wage a war of extermination. One might argue that the humanitarian damage of a tight blockade outweighs the damage inflicted by a few Qassams, but I cannot imagine how anyone would reasonably expect the Israeli government to accept such a benefit-cost calculation. Would anyone care to explain to Olmert and Livni how to calculate the acceptable number of Israeli civilian deaths from Hamas' attacks? Critics of the Israeli war against Hamas invoke disproportionality, but this implies a strange ethical eye-for-an-eye calculus in which one loss for Israel calls for one but only one loss for the Palestinians. The implicit logic of the critics first would have Israel end the blockade, and then begin making small proportionate retaliations, since Hamas is currently weak and incompetent. And then as Hamas increases the quantity and effectiveness of its weaponry, Israel can escalate its responses proportionally. The moral calculus invoked by Ban Ki-moon and others is bankrupt, and the resulting condemnations of the Israeli response are similarly flawed. The concern ought not be that Israel has overreacted, it’s that the blockade and recent incursion may prove to be an underreaction. We ought to be worried that we heading for the day when the appropriate Israeli response will not be a harsh incursion into Gaza, but a nuclear attack on Gaza, which is what WMDs in the hands of Hamas would imply. So long as Hamas calls for what is effectively genocide, the tolerance and forbearance of the international community for it is both immoral and strategically senseless... thus potentially terribly destructive. 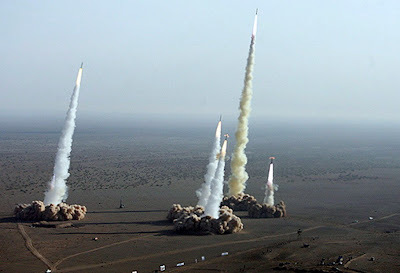 Photo: Iranian missile test. It would be nice to open the Gaza borders; with a supply of these coming in the Israel-Hamas military balance would be much more proportional and hence fairer, right? That's the motto of the conservative Media Research Center. And their director, Tim Graham, cautions us, "It’s always wise to check out the actual science developments on global warming issues when liberal reporters insist, with a rather unscientific attitude, that there is no opposing side to report on." Good point. And it applies doubly when conservative "media experts" are doing the reporting. In Graham's A Non-Melting Arctic Ice Update (on the MRC "New Busters" site) he illustrates the "liberal reporter" bias on global warming by contrasting an op-ed in the Washington Post (by a member of Ocean Conservancy, not a reporter) that mentions loss of polar sea ice with recent findings as reported in the online "Daily Tech." Graham's "Daily Tech" quotes really didn't seem to me to contradict global warming, but as Graham counsels, I decided to be "wise" and "check out the actual science developments." So... straight to the original source I went, to the site of the University of Illinois Urbana Champaign Department of Atmospheric Sciences Polar Research Group for the data that purportedly contradict the melting sea ice op-ed. Interestingly enough, the site has a link to a nice little summary of the Polar Research Group findings that explicitly address the (ahem) errors in the Daily Tech article. As it turns out, PRG reports its findings are actually quite consistent with predictions of models that show global warming, and that measured reductions in ice areas understate ice losses, since they don't account for lost ice volume. MRC's media experts claim the purpose of NewsBusters is "to provide immediate exposure of liberal media bias, insightful analysis, constructive criticism and timely corrections to news media reporting." I wonder how timely their correction to their own work will be. I hoped this topic could be set to rest, but after hearing hearing President Bush's farewell address last night I realize three more brief comments are in order. 1. The President argued that his policies prevented further terror attacks in the U.S. after 9/11/2001. This assertion is oft repeated by his die-hard supporters, but it is wrong. Post hoc, ergo propter hoc. I've not been able to quickly locate it, but a year or two back (2006-7 I believe) Foreign Affairs carried an interesting article that rather persuasively argued that the size and effectiveness of al Qaeda had been greatly overestimated. Siimilarly, the claims by John Ashcroft and other Bush officials that al Qaeda had thousands of sleeper agents seem entirely wrong - a pure fabrication, I think, since no evidence has ever been given. Whether this originated in prudence, in paranoia, or in a willful attempt to instill fear in the citizenry to convince them to accept the suspension of habeus corpus and imposition of police state measures is unclear: it's likely a combination of all three. But the absence of further attacks is not proof of the success of Bush's policies. On the other hand, the growing instability in the Middle East and Central Asia is directly attributable to Bush's misbegotten policies. 2. My anger at Bush isn't simply a disagreement over policy. It's over the hubris, dishonesty, willful violation of the Constitution and of law, corruption, viciousness, irresponsibilty, lack of personal integrity, and most of all the disrespect of individual rights that characterizes George W. Bush and his administration. The examples of this are legion. And unfortunately, it goes beyond simply Bush and his crew, and has infected much of the Republican Party and conservative movement. An unpleasant example is the Scholzman Scandal, just one of the DoJ politicized hiring scandals. The Bush administration, starting with George W. Bush, explicitly promoted the idea that anyone who disagreed with them is a an unpatriotic traitor - a vicious lie that is too often found in today's "conservative" "discourse." 3. But I fear I have gone overboard in my criticism by ignoring the constructive achievements of the Bush in his tenure in office, so credit where it is due. No one has done more to discredit neoconservative foreign policy and crony capitalism, and to weaken the Republican Party than George W. Bush. And for that, we here at UC thank him. Note: the inset chart illustrates Bush's legacy in terms of the federal budget. Taken from the recent "Deficits, Debts, and Looming Disaster" in the St. Louis Fed's "Regional Economist." Click on the chart for a clearer view. Well, they know a lot. But whether this helps them fully understand what is really happening is another question. Menzie Chinn has a particularly good analysis of possible causes of our economic debacle: succinct, clear, and nicely argued. While he doesn't mention it, "animal spirits" also should be rejected. Once one understands the perverse incentives created by the institutional and policy environment, the current mess makes sense - no need to appeal to "irrational exuberance." This begs another question, though: why did so many economists and policy makers seem not to understand what was happening? Why is our understanding so often after-the-fact? Here's my conjecture, and it also helps explain another conundrum I've raised elsewhere: why so many economists who in late 2007 and early 2008 alluded to the Hayekian business cycle as an explanation for developing events now call for Keynesian stimulus as a response. I just watched Ben Bernanke tackling Q&A after his recent LSE lecture. The second question asked him whether this mess didn't cast doubt on the entire Keynesian paradigm that macroeconomists almost universally accept, and whether the Mises-Hayek "Austrian" view might not have something valuable to offer. Chairman Bernanke was either unable or unwilling to answer this question, and simply rambled about the benefits of markets and the importance of the Austrian insight that markets aggregate information. My guess is that most macroeconomists, including Ben Bernanke, actually have next to no idea what the Austrian alternative, or other micro-based approaches to macro, might be, and are left trying to explain things on the basis of the broadest aggregates that don't really capture the many human actions that underlie them. In my graduate school days at NYU, one of the cutting edge topics in monetary theory was whether the Fed responds to or drives interest rates and economic fluctuations. I just took a short course in monetary theory from two respected U. Minnesota economists and advisors to the Fed (excellent course, BTW). One of the things I came away with is how little monetary theory has advanced beyond this. In my view, macroeconomists remain wedded to a theoretical paradigm so exclusively devoted to aggregates that it cannot make the jump to our world of heterogeneous capital. It's perhaps worth mentioning that a respected MIT economist seems to have begun arguing essentially the same thing, in another context. It's not that macroeconomists don't understand that differences across individuals, firms, industries, markets, and sectors are important; it's that the current paradigm is poorly equipped to model these differences. Hence despite the general recognition that expansionary monetary and fiscal policy led to malinvestment, the only solution most can see is for government to stimulate aggregate demand. And also, hence the failure to suggest the reforms to monetary and fiscal policy that are really called for. All of this has me thinking that economists are barking up the wrong tree in proposing economic reforms: I suggest that the first thing we need to do is reform macro. In 2005 I realized that commenting on the Bush 43 regime was an endless task, a black hole, and largely swore off such commentary. Since then I’ve hardly been able to wait for this "goodbye to Bush" post. * Started an unnecessary war in Iraq. * Incompetently fought that war, and another in Afghanistan, exhausting our military and offending most of our allies in doing so. * Strengthened Iran in the process. * Rejected Iran’s 2003 offer to disband its nuclear programs. * Abandoned serious diplomacy and negotiations in the Israeli-Palestinian conflict. * Tried to abolish habeas corpus in the U.S.
* Instituted torture as standard policy. * Instituted "extraordinary rendition" to sidestep justice systems here and abroad. * Established concentration camps at Guantanamo and Abu Ghraib. * Promoted inflationary monetary policy that led to the housing asset bubble. * Allowed his Justice Department to block state investigations into subprime lending abuses. * Established one of the most expensive welfare programs ever, Medicare D (the Prescription Drug Benefit). * Promoted unceasing fiscal irresponsibility with record federal deficits. * Promoted trade barriers by imposing tariffs on imports from China. * Engaged in the greatest nationalizations of private property ever seen in America, with the so-called "bailouts." This deserves special emphasis: Bush is America's greatest socialist. * Instituted mass domestic spying on American citizens, without warrant. * Promoted and gained retroactive immunity for private corporations who facilitated this spying. * Pushed through REAL ID legislation, a national biometric ID and de facto internal passport. * Presided over the Katrina catastrophe, in which his incompetent political appointees diddled while Americans suffered and died. * Politicized DoJ and similar hirings, making political correctness, rather than competence, the basis for hiring. * Blocked investigations into corruption, drug use, and use of prostitutes by administration appointees in Interior who were awarding federal contracts. * Publicly endorsed gun control (debating John Kerry in 2004). * Mangled the English language repeatedly, and embarrassed America in front of the world by acting like an uneducated idiot. My list could go on and on. This man’s presidency has been a catastrophe beyond belief. He has even offended some of his most ardent supporters. Joel Belz, editor of the evangelical news magazine World, and until now a great supporter of Bush, expressed horror at Bush's recent inarticulate babbling about his doubts about Christianity. It’s unfortunate that these doubts didn’t give George pause when he supposed God had selected him to impose democracy on the Middle East. (The editorial is worth tracking down, dear readers.) His was a regime so awful that numerous American military officers and legal scholars think that war crimes trials of Bush and his advisors would be within the realm of reason. This is the man who looked into Putin's eyes and saw gentle kindness. This is the man who told reporters that Social Security is in jeopardy because the trust fund in nothing but federal government bonds, worthless IOUs... and a moment later said that under his privatization scheme, citizens preferring a safe asset could invest in, umm, federal government bonds. This is the man who financed his mad regime by selling said bonds to Asian central banks, to the point that most of our national debt is held by foreigners, and not very friendly ones at that. I was relieved when Bill Clinton finally left office. He was clearly an opportunist and a crook. But when he left, the American economy was in reasonably good shape, the federal government had a budget surplus, the former Soviet Union was thing of the past, the world was mostly at peace, and it looked as though we almost had a settlement of the Israeli-Palestinian conflict. The world was a hopeful place. By contrast, Bush leaves a dreadful shambles in all these areas. Wars, defeats, police statism, fiscal and monetary irresponsibility, economic fiasco, socialism, general irresponsibility, incoherence, abrogation of the rule of law, and lack of personal integrity - that's the Bush legacy. I hate George W. Bush for what he has brought to my country, and to the world. 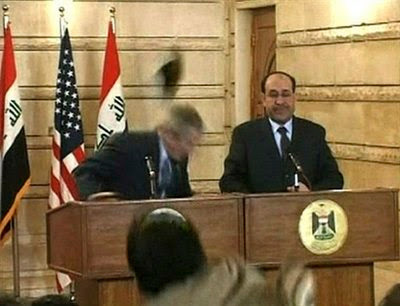 So George W. Bush, good riddance to you, you evil man - and two shoes to you, wherever you go.